I've never owned an HTC device before, so this is somewhat new territory for me. However, I have owned numerous Android devices, and am familiar with "flashing ROMs" and "kernels". I remember being in the UK during the public's transition from feature phone to iPhone stylised phones (I was also in Japan for the same transition some years later), and vividly remember an HTC device with a *huge* 4" screen and a large clock and weather widget on the home screen. Times have changed. The iPhone now sports a 4" screen, and most Android phones have screens between 4 and 5 inches (though most new phones are between 5 and 6 inches). Just as with modern cars, the modern mobile phone is now significantly larger than 15 years ago (e.g. the minuscule Nokia 8210 I loved using circa 2001). My favourite phone in recent times has been my Samsung Galaxy Nexus. I kept the phone for just over a year as my main phone (rather long for me). Recently, I have been using a Nokia Lumia 920 which runs Microsoft's new Windows Phone 8 operating system. It's a great phone [the 920] but suffers somewhat from a lack of key applications (e.g. there is absolutely no native maps application which works here in Japan). After much uhming and ahing, I've returned to Android. Upon booting the device, I was told I've been upgraded to 40GB of Dropbox space, and 40GB of Google Drive space - fantastic! The phone is a masterpiece of design. I chose the red model, because red is my favourite colour, and I like to be different. Most people have a black or white (or gold?) phone these days - and this phone definitely stands out. The phone is svelte, and fits very nicely in the hand. It feels much smaller and lighter than the 920, though that's no mean feat. It's all-metal, unlike Samsung phones. I owned a Note 2, and liked it quite a lot... but it felt so cheap compared to this. No shiny plastic here. On the front is a 4.7" LCD screen, with 1080p resolution - that's more than our TV! The result is amazing viewing angles, colour reproduction, and fantastic video quality. The gorgeous screen is sandwiched by one of this phone's most important features - its stereo speakers. There's a microUSB port at the bottom, volume rockers on the right hand side, a 3.5mm headphone port at the top, and a power button at the top left (a bit odd, but you get used to it). The power button doubles as an infrared remote, which is genius. I use it to control our TV all the time. Of course, it's no 5.1 surround system, but in terms of mobile phones, nothing else comes close. One really has to hear it to believe it. The sound emanating from the HTC One is clear, rich, deep, and full of tonality. The specifications can be found elsewhere, but in terms of usability, it's a game changer. I always want to watch Youtube videos on my phone rather than my computer or tablet, due to the amazing screen and stereo sound. Speakers should be on the front of all tablets, in my opinion. The iPad is an excellent media consumption device, but has a terrible speaker (and placement). 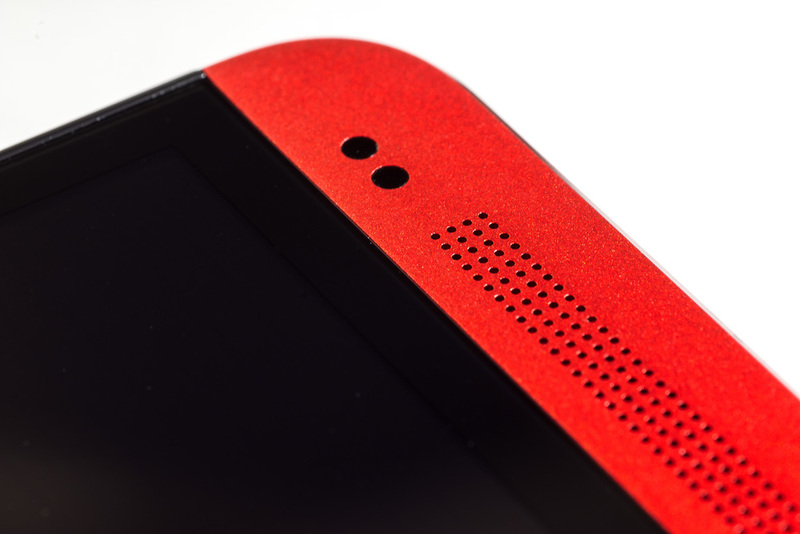 The HTC One speakers not only look great (machine drilled aluminium), but sound fantastic. It's called Boomsound with Beatsaudio, which is... meh. The sound quality however, is anything but. The included headphones are stellar - I actually use them regularly on my commute, when not using my full-sized MDR-1R. Apple should make their iPhone headphones this good. Full marks, HTC, well done. I like to take photos - you may have noticed! I had Nokia's first cameraphone, the 7650, back in 2002 - and I think I've only owned cameraphones since. These days, most phones have camera modules pushing 10 megapixels or thereabouts. This phone has only 4 megapixels, but each pixel site itself is around twice the size of a standard camera phone. What that means, is that more light is gathered by each pixel, which improves the camera's low-light ability, and signal-to-noise ratio. It also means that zooming in on a photo is all but pointless - the resolution simply isn't there. Below: Gallery of images taken with the HTC One (click to advance), taken from my VSCO Grid. The camera app itself is very fast to load, and is packed with features (filters, custom modes). Its also the place where the "Zoe" (short for zoetrope) feature can be used. Zoe is fantastic. At one press of a button, a 3 second video is recorded (though it actually records before you press the button), which allows you to export as a video, gif, or choose a video frame to save as a picture, use slo-mo... the list is exhaustive. It's a great feature and is really useful in recording action scenes. I very much like the camera, but it's not the best mobile phone camera available. The UI is Android, with HTC Sense 5. Android is open source software, but many people seem to be a little confused about what pure Android is. Pure Android is not shipped on a Nexus device - it's pure Google. AOSP is pure Android, and Google want users to choose Google services - that's what the Google Play Edition (GPE) HTC One is, for example. Sense 5 is HTC's Android skin, and I never like skins. Until now. Surprisingly (to me), I think Sense 5 adds a lot to the Android experience. The font throughout is Roboto Condensed, which Google themselves now use in the latest version of Android, Kitkat (coming to HTC Ones this month). The software has been reviewed to death, but the addition of power toggles, excellent homescreen options, blinkfeed (news), and other little shortcuts, really improve the usability of Android. It's also very polished, so I would have to give HTC top marks here again. In conclusion, the HTC One is the best Android device I've ever owned, by a considerable margin. The quality of both hardware and software, is excellent, and synthesised very nicely. I thought I would wish it was rooted, and that I would install the GPE ROM as soon as I turned the device on... but I have no desire to do so. Sense 5 adds a lot to the experience of Android, and there's nothing in Google's "stock" Kitkat that makes me wish I had 4.4 already. I can only recommend the HTC One - but it's almost a year old now, so if you're in the market for a new phone, either wait for HTC One bargains, or keep your eyes peeled for the next HTC device.